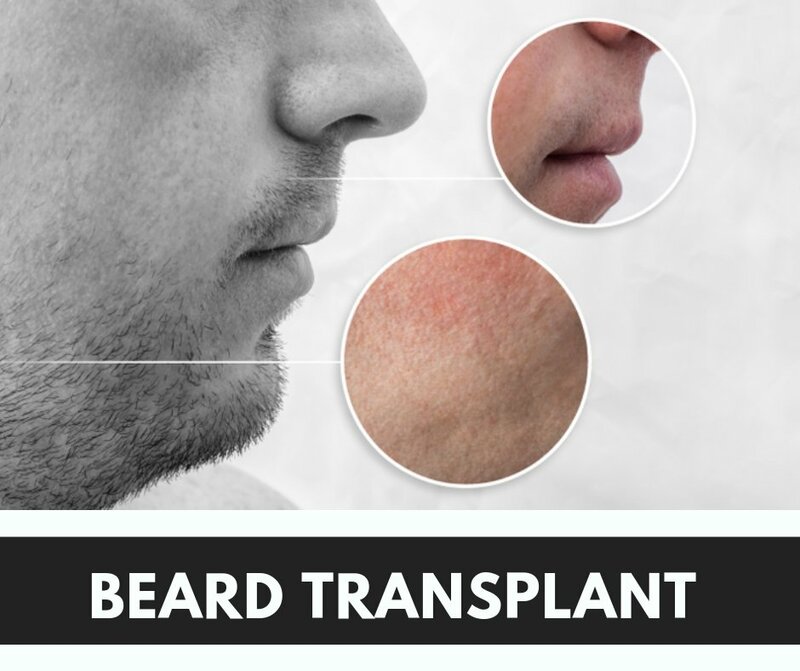 The More common form of Beard Transplant is when Beard hair grafts are used as a donor source for the person with insufficient donor hair on the scalp or in a person with a higher grade of baldness. In such cases, Beard hair grafts are excised with the help of FUE hair transplant and implanted on the bald area of the scalp. Recently there is a fashion of keeping Beard, it is considered to give a smarter and manly look. We can see our cricketers like ‘Virat Kohli’ and actors like ‘Ranjeet Singh’, all are keeping the beard and this gives our youngsters an inspiration to look like the same. In some persons, because of genetic reasons, beard is not as thick as they want or there may be some bald patches in it. These thin beards make them conscious of their look so they want beard reconstruction. It can be done by implanting hairs in the beard area. Here we take hair grafts from the scalp either by FUT or FUE and then implant them in the beard zone so as to give them natural thicker beard. It is said that ‘Tiger Shroff’ has undergone beard reconstruction surgery for his thin beard. How Much Does Beard Transplant Cost? Cost of beard Transplant is more than the normal hair transplant. It also depends upon the surgeon, some hair transplant doctors are taking charges as per graft and they take equal charges for scalp hair transplant and beard transplant. In the US charges are too much, it is around 10000 to 15000$ but beard transplant in India is comparatively very reasonably charged with even better quality. It is around 100000 to 300000 Indian Rs depending upon the graft requirement. Also, Indians and Asians have good beard hair so beard hair transplant is more common in India. Beard hair grafts are thicker and they grow with some curl, these two factors are advantageous as they give better volume when implanted to the scalp. One thing which should be kept in mind is these should not be implanted in the hairline and temporal triangle as we need thin hair here to give natural look. Beard hairs are usually mixed with scalp hair so as to give natural look. They are good for the mid-scalp and crown area. One more advantage with the beard hairs are, they grow in the influence of male hormone (as against the temporary hair on the scalp which falls because of male hormone). Beard Reconstruction when done using scalp hair, it also gives a good look. The points to be taken care of here is the direction of the hair in the beard and the normal shape of the beard should be maintained. We have limited donor hair so use them in the way that they can give maximum visual effect. Beard Transplant (reconstruction) can be done in any person who is willing to go for it and is medically fit for it. In persons with positive family history of baldness, they shall be explained that they may need hair transplant for the scalp in the future so donor hair of scalp is to be preserved for that also. A good candidate for Beard hair grafts as a donor are those with very good density of beard hair. Those who are having a very heavy beard in the unwanted area like a neck, those who do not want to keep their beard and have limited scalp donor area. Even after excising 2000 grafts from the beard, a person can keep his beard and nobody can detect that hairs are taken out from this zone. This is possible with the use of 0.7 mm sharp punches. So use of beard hair and body hair makes it possible to give good coverage in the patient with a higher grade of baldness. Beard hair grafts grow under the influence of DHT ( Dihydrotestosterone), this is the active form of testosterone which is responsible for the miniaturization of the scalp hair. So when beard hair is implanted on the scalp they keep on growing under its influence and are permanent. When we reconstruct beard, hair grafts are taken from the permanent zone of the scalp( occipital and adjoining periauricular area), so this hair does not fall with the aging process and act like permanent hair. What is The Best Procedure for Beard Transplant? Beard hair can only be harvested by the FUE method. Very small size sharp punches are used to take out beard graft, these punches cause minimum trauma to the skin and the very tiny hole which heals by itself in a day or two leaving an invisible scar behind. For Beard reconstruction, we can take grafts from the scalp either by FUT or FUE. In FUT, a strip of skin is taken from the scalp and this is the dissected under the microscope to obtain the follicular unit. In FUE follicular units are excised by the surgeon directly from the scalp. Both the technique are good, it depends on the surgeon choice which method he wants to adapt. Nowadays FUE is preferred because of less post-operative discomfort and absence of long linear scar on the back of the scalp. Implantation in Beard reconstruction is more demanding as facial skin is loose so chances of popping are more; proper traction is required during the procedure. Only experienced surgeon and technician must do the implantation so as to give the natural direction of the beard hair. What is The Side Effects of Beard Transplant? Side effects of hair transplant are not very common and are temporary in nature but they should be taken care of-There can be Redness, itchiness, oversensitivity or numbness of that area, there can be small cyst formation because of the buried grafts, very rarely infection may occur. To avoid these when we extract the beard hair care should be taken to remove the graft intact, if sheath of the grafts remains in the place (desheathing) this will lead to cyst or papule formation, so be careful while removing grafts. Need Care for After Beard Transplant? Care is needed when beard reconstruction is done. For the first two days, a soft diet must be taken to avoid chewing, as this may cause graft displacement and direction of the graft may change. Also, care is needed to prevent graft removal so avoid rubbing of the face. The implanted grafts will fall in 3 weeks and then permanent hair will grow after 3-4 months so do not worry about that and be in touch with your hair transplant surgeon. If the beard is used as a donor after beard hair harvesting, no special care is needed you can wash your face very next day and apply an antiseptic ointment. Also, you can shave your beard. So Beard Transplant is the latest technique which is used to improve the result of hair transplant in a higher grade of baldness. This is a type of FUE hair transplant and gives hope to many bald persons. Beard reconstruction improves the self-confidence of the person. To get a good result you should choose the best hair transplant centre in India for a beard transplant.